The Romance Anonimo ("Anonymous Romance") is one of the most popular pieces in the classical guitar repertoire. Also known as Spanish Romance, Romance de Amor, Jeux interdits and Estudio de Rubira, this 19th century work has continually delighted lovers of the instrument around the world and has become a standard part of guitar pedagogy. In this Mel Bay publication guitarist/composer Rico Stover offers his original composition Romance Variations in a 25 page score of the work with accompanying audio. 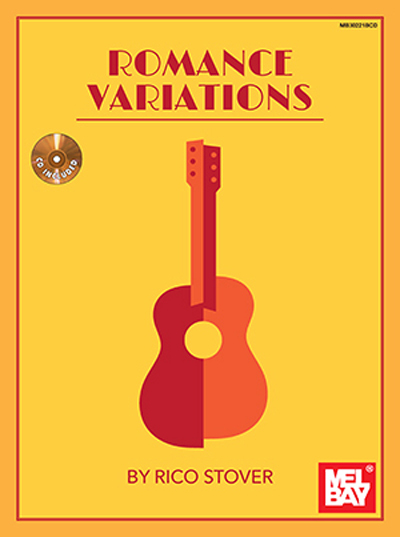 Different "flavors" of guitar styles are heard in these variations which are inspired by guitarists/composers whom Rico admires: Mateo Carcassi, Joe Pass, Heitor Villalobos, Luiz Bonfa, Chet Atkins and Atahualpa Yupanqui. The essay "Romance Anonimo: Who Composed It?" explores the different theories regarding the question of authorship, including an analysis of seven different editions of the Romance that date from 1900 to 1958.